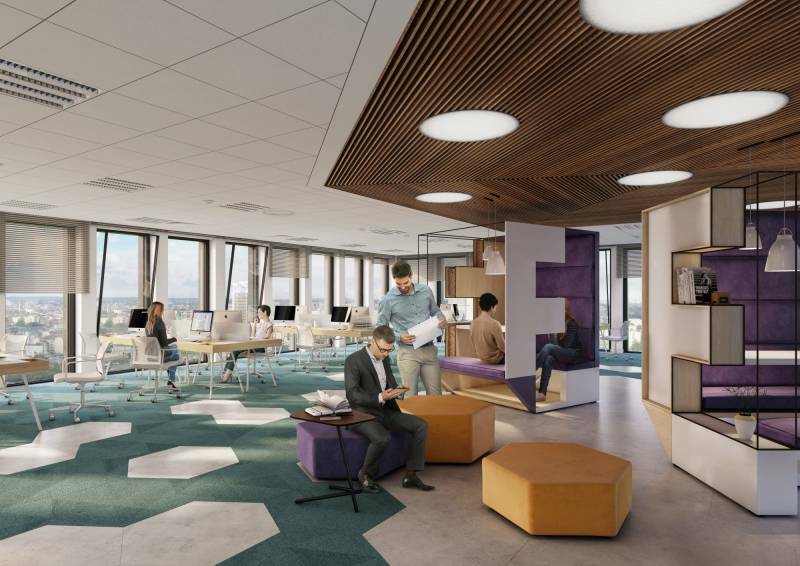 L'Oreal, WeWork, EPAM, Havas and Inter Cars - these are only some companies that chose office space from Echo Investment last year. In 2018, the developer signed lease agreements for a total area of nearly 80,000 sqm. This year also seems to be busy - the company plans to start construction of approximately 100,000 sqm of offices including in Warsaw, Wrocław, Łódź and Kraków. Projects with a total area of 150,000 sqm are being prepared. Very good results were recorded on the Polish office market last year. According to the latest report by Savills, the office property market grew in 2018 by approximately 750,000 sqm of new space, expanding to 10.4 million sqm. This increase, however, goes hand in hand with the demand of tenants. A successful year is clearly exampled by Echo’s successes. “The good standing of the market was reflected not only in the high demand for our office space, but also in the growing interest of investors looking for the best projects. In 2018, we started the construction of four projects with a total area of 93,000 sqm in Warsaw and Katowice. We leased a total of nearly 80,000 sqm, and among our tenants we can find such outstanding companies as L'Oreal, WeWork, EPAM, Havas or Inter Cars. We also sold three office buildings for a total amount of EUR 115 million” - says Rafał Mazurczak, a board member of Echo Investment responsible for the office department. This year, the developer continues the strategy of creating the so-called ‘destinations places’, i.e. city-forming development projects which offer space not only to work, but also to live, do shopping or just meet each other. "The flagship example of "destination" are Browary Warszawskie in Wola consisting of 110 000 sqm of mixed use development and another example the office-residential complex Moje Miejsce in Lower Mokotów. Echo is also having in the pipeline to build such projects in both Łódź or Kraków and are actively looking for addition destination locations in all the regional cities where the company is being present. Echo are among frontrunners of office developers in Poland having today five projects ongoing and another six in the pipeline. 2019 seems to be busy for us - we plan to start construction of approximately 100,000 sqm of office space - among others in Warsaw, Wrocław, Łódź and Kraków. We will put into use the first stage of Moje Miejsce in Warsaw and the first stage of Face2Face Business Campus in Katowice. We also count on cooperation with such prestigious tenants as last year” adds Rafał Mazurczak. Currently, Echo develops five buildings - three in Warsaw and two in Katowice, simultaneously finalising agreements with key tenants. In the first quarter of this year, the developer will be able to show 50 percent commercialisation of both stages of Face2Face Business Campus in the capital of Silesia consisting of totally 46 000 sqm and are having active negotiations on all remaining spaces in the buildings. The construction of another two office buildings in Browary Warszawskie is underway – in case of the “Biura przy Willi” building agreements are being finalised, which will allow to reach the 95 percent lease-up. Equally good news comes from Moje Miejsce in Lower Mokotów, where the first building is 60 percent leased and soon the second stage of the project will start. During Q1 2019 we will also start up more projects in the regional cities to meet the increasing demand from our tenants for modern office space. “Last year showed again that Echo Investment enjoys the trust of business partners. We had leased space to well-known companies at the construction stage, then to conclude agreements for the sale of buildings to investors who select the best properties. This year, we are continuing the construction of our flagship project, Browary Warszawskie that all builings will be completed by the summer of 2020, and at the same time we will preparing to invest in another destination projects, such as Taśmowa and Towarowa 22 in Warsaw, Tymienieckiego in Łódź or Wita Stwosza in Kraków” says Rafał Mazurczak.